Physical three-dimensional models have a special place in the history of urban representation, because of their essentially military function. Italian engineers probably invented the technique in the XV century in order to study means of protecting Levantine cities from the Turkish armies. During the XVI century, as a manifestation of the importance attached by the Republic of Venice to the security of its naval routes, its Government known as “la Serenissima” commissioned various relief models reproducing important settlements situated on the shores of the Mediterranean Sea. Around 1570 other relief models portraying major cities and their environs were produced in southern Germany under the Duke of Bavaria, Albert V. Some of these models are currently conserved by the Bavarian National Museum in Munich. 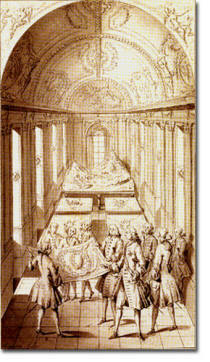 In Europe the period of glory of 3-dimensional modelling came with the reign of Louis XIV (1661 to 1715), the Sun King, who ordered the manufacturing of 140 scaled raised relief models depicting cities that had recently been incorporated into the Kingdom of France, so that he could see for himself the bastioned fortifications proposed by his military engineers. The relief models were instruments of exclusive knowledge management. In the United States – at the end of the XIX century – dramatic increases in the quantity of geographic information stimulated a flurry of innovation in terms of visualization and communication methods. Techniques for producing three-dimensional relief maps were developed and their production increased dramatically during the last two decades of the century. 3D models became a popular medium for communicating the state of geographic knowledge in schools, museums and major public exhibitions. Displays at the Columbian World Exposition of 1893 in Chicago included some 100 relief maps. 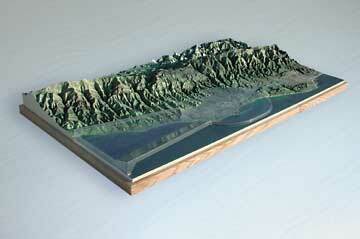 Santa Barbara Airport soild terrain model. Source www.stm-usa.comThe use of solid terrain elevation models for strategic military purposes persisted throughout the first world war until recent times. The use of scaled 3D models for urban planning has been maintained as practice among many public administrations. Today, large-scale urban or rural development projects are usually reproduced as scaled relief models for communication and decision-making purposes. Over the past si x centuries the use of 3D models has undergone substantial changes. Conceived essentially for defensive purposes, they represented an efficient means for military engineers to interact with the monarch and highly placed government officials, thus with a selected and restricted power-holding elite. In recent times their use opened up to the public as the tool gaining importance for educational and communication purposes. Nowadays scaled relief models are seen mainly as a two-way communication channels, between planners and/or government institutions and between these and the public. Nonetheless, all these six hundred years of history share a common trait: engineers and artisans have fabricated relief models behind closed doors. Only in modern history the public has been called in, but mainly as a spectator or commentator in a process of consultative participation.